Fresh from my Skype visit, I received this kind note from North Carolina, which is an actual state in the United States. 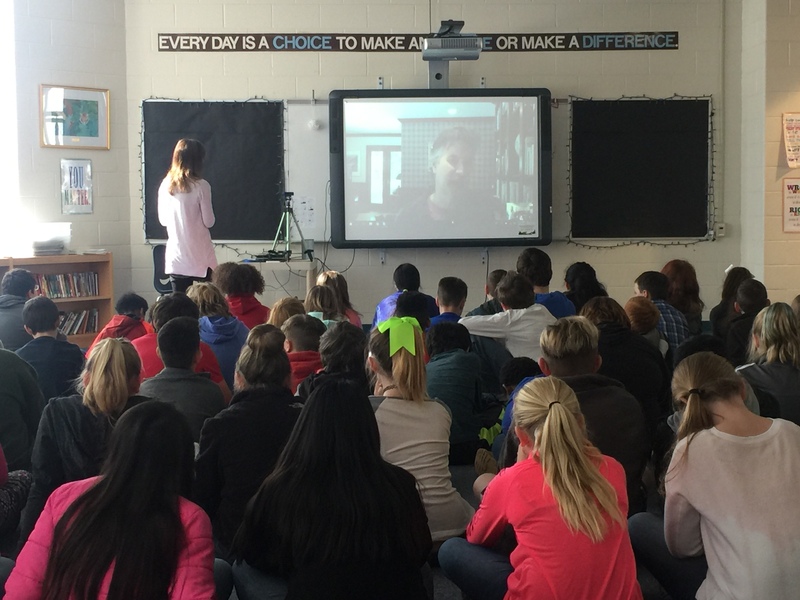 Thanks again for the wonderful Skype session today! My classes had some great discussions about the responses that you gave to their questions! It was an incredible experience for them, and me! 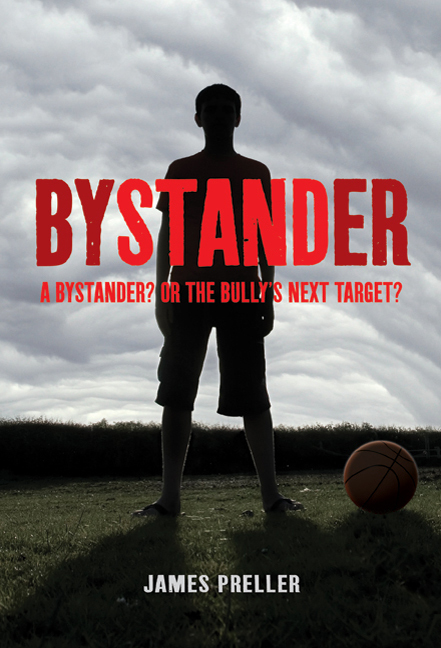 I would love to purchase a Bystander poster. Please let me know if you have such a thing to offer. I finished The Fall today. I loved it, too! I ordered The Bell Jar because I am very curious after you referenced it several times in the text. I am attaching a photo from our session today. Our media specialist may have more, but this is the only one that she sent me. I am looking forward to ordering your latest book! Also, my students are begging me to read The Fall to them. I have asked our guidance counselor to read it first to make sure that she thought it would be ok as a read aloud. It obviously touches on a more sensitive topic than Bystander. It will definitely be made available for checkout to my students either way. Thank you for this note and the photo. Was I really that dark during the Skype? Or is it just the photo? I wonder if I should focus on proper lighting in the future. I enjoyed the questions and the experience, thank you for making it happen. I appreciate your thoughts on The Fall. I understand where suicide is a sensitive issue, and should give any educator pause before sharing the book with a large group. However, The Fall was (loosely) inspired by real events. These terrible things happen. The book is not really “about” the suicide, but goes deeper into the potential implications of cyberbullying, i.e., how we treat each other. Honestly, for me, the deepest theme in the book is forgiveness. I’m proud of that book and know that many readers, generally grades 7-up, have been enthusiastic about it. 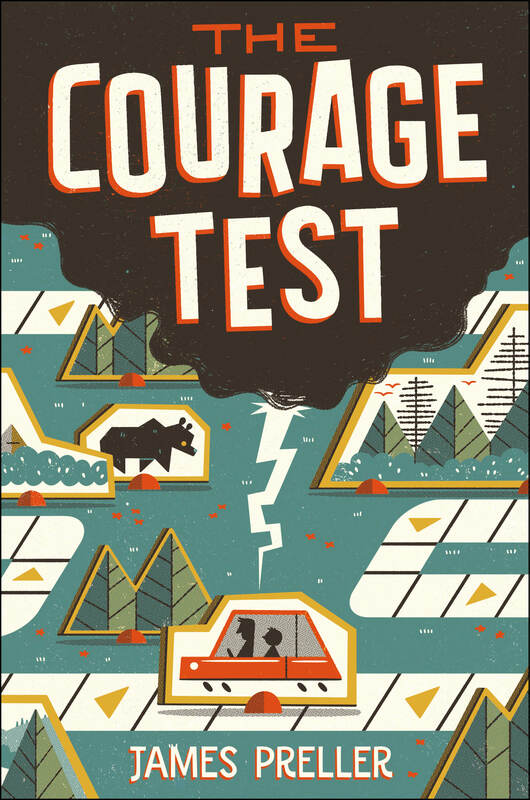 The book was nominated for the Sakura Medal in Japan and listed in the 2017 ALA midwinter meetings (by YALSA) as a “quick pick” for reluctant readers. If this is any help, I’ve listed some review comments below. Thank you, I hope our paths cross again. And yes, Dear Readers, there’s even a postscript — because Susan wrote back with this . . . I agree with everything that you said about The Fall. Our guidance counselor is halfway through it and says that she absolutely loves it! We both agree that it does not focus on the actual suicide. The theme of forgiveness, as well as students realizing what could possibly happen as a result of bullying is very powerful. My students are begging me to read it, so I feel almost certain that it will happen! Thanks again for being so approachable! We met with a parent this morning and all she said her son was talking about last night was the SKYPE with you! This is such a powerful opportunity for our students, and I feel very fortunate that I was able to make it happen! Today’s “Fan Mail Wednesday” is a little unusual. 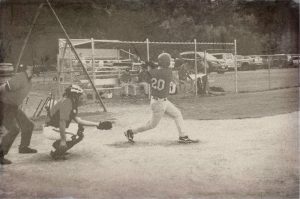 It’s a note from Ed, my teammate on the “Whiz Kids,” an old men’s hardball team. To date, he remains the only catcher who believes in my change-up. Mighty Preller at the Bat. I hope you’re having a great off season. My daughter and I have a reading streak. My wife saw an article in the NYT about a father who read out loud to his daughter every night from grade 4 to her freshman year in college for at least 10 minutes. Kelsey and I decided to take on the challenge when she was in third grade. She is now a freshman at AAG . 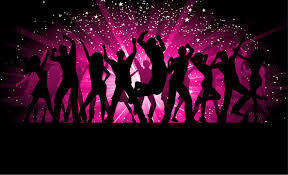 We have not missed a night. It the most special thing between us. We have read all kinds of books. We both get to make picks so I picked The Fall. It is a great book. As we read it I expected Kelsey to have strong opinions about Sam and Morgan and the actions of the other kids. Each night as we read the book she was very quiet and just went to sleep. This all changed when Sam bought the jewelry for Morgan and dropped it off the tower. When I looked up Kelsey was crying. She had never done that before. At this point all her feelings about Sam and Morgan tumbled out. We had a great talk. She loved the book. Sorry it’s taken me a couple of days to respond. It’s hard to know what to say except for thank you for those kind words. It’s the nicest gift you can give a writer: 1) reading the book, and 2) saying something nice about it. I remember reading about the young woman who read with her father that you referred to in your note. I think I might even have blogged about it, years ago. It’s amazing that you and your daughter have managed that same feat. I’m blessed to have (sort of) shared that experience with you, through my book. 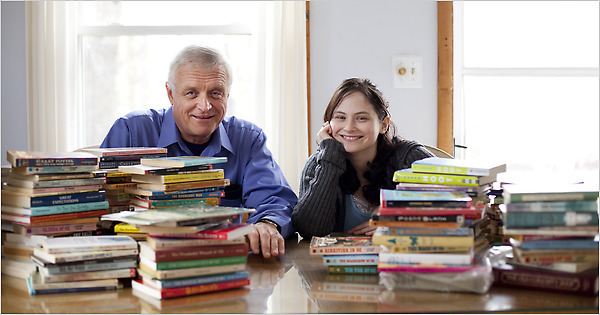 The article was published in March 2010, written by Michael Winerip, titled “Father and Daughter Bond By Years of Reading.” The daughter, Alice Ozma, eventually wrote a book about it, THE READING PROMISE: MY FATHER, AND THE BOOKS WE SHARED. Thanks again, Ed. I was moved by your letter. And I look forward to another season of baseball. Hi. I don’t necessarily know about you and your books much; I wouldn’t really call myself a dedicated reader to you in particular because, to be perfectly honest with you, I picked up ‘Bystander’ a few days ago and am just now getting into it. So far, it is a really good book that I believe is addressing a great topic. Your books, like it explains on your blog, is written for grade schoolers to middle schoolers. I am currently in 8th grade [ed note: school and town deleted] in Missouri. I’m well aware that this may so far seem that I’m trying to get you to come to my school or something or other, but I’m really not. I just wanted to say, I love how you are writing these books for children of all ages with such serious topics. It’s really great that a man like you is spreading the word through a book that is going around so quickly to such a widespread audience. Blah, blah, blah, I know you must get this a lot. Me, being an aspiring author, I just wanted to give more of what I might think have/will impact the book or future books you write. I understand you are an actual author who I am currently emailing my 8th grade opinions to, and I know that you probably may never read this, but it doesn’t hurt to try. If you’re planning on writing any more books, which I hope you are, you could put more in the first person. I, personally, think ‘Bystander’ would be better as a first person novel. With the whole bullying topic of the book, you would get more out of Eric, the main character, as if the book were in his perspective. Don’t get me wrong I’m not dishing the book, but showing grade schoolers that there’s more than just the third person writing they have always been seeing could increase their tastes in reading and help them develop a future of late nights finishing lovely books, like yours. I’m well aware that you can’t change a book that you’ve written already, but maybe for the future? P.S. I am so super sorry about how this may seem. I don’t want to be rude or anything; that is not the purpose of this email. You are a great author and I wish to become someone like you in my future. Don’t ever change without your own permission. Thanks. Thanks for this most awesome of emails. Believe me, I don’t get emails like yours all that often. You’re an original. And by the way, I’ve actually never — weirdly — been to Missouri. So I’m open to an invitation. 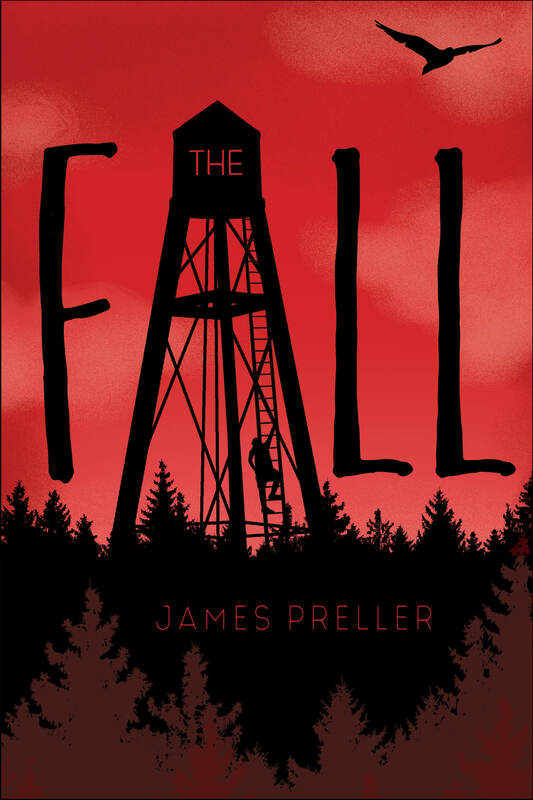 THE FALL explores similar themes as BYSTANDER, but shifts to a first-person POV. Readers might enjoy comparing the relative strengths and weaknesses of those choices in perspective. You strike an almost apologetic tone at the end, so let me start there: Don’t be silly! Express away! As a reader, your opinion is always valid. And as an aspiring writer, you bring a writer’s perspective to that opinion. In this case, you could be right — and you certainly aren’t wrong. The question of first person compared to third person comes up for every book. There are strengths and limitations to each approach. I’ve written books from both perspectives, though I don’t think I often analyze it too deeply. It’s more of a feeling, I guess. Some books seem right from the first-person perspective — you hear it coming from a very specific voice — and you want that character front and center all the way through. In other books, well, not so much. For some books, I’ve even tried it both ways in early drafts, exploring the differences. There are certain freedoms in a third-person narrative that are not available in the first person. And also, I’ll confess, I come across so many YA novels that are written in the first person that I get very, very tired of it. The writing in a first-person book, depending upon that character, tends to be looser, more informal, the way people really talk. As an extension, that perspective limits the syntax available to language that character would believably use. With first person, there are places you can’t go. For Bystander, though I wrote it in third person, I decided to hug very close to Eric’s point of view (a limited omnipresence, if you will); I didn’t go for a full omniscient POV, bouncing around inside a variety of skulls. On the other hand, I recently had an idea for a book that would be told from multiple perspectives. A lot of characters at the same event. So to me, the way we decide to tell the story is a revelation of the story itself. At the same time, you could tell that story from third- or first-person perspectives. Decisions, decisions. Illustration from SWAMP MONSTER by Iacopo Bruno. In a scary story I recently wrote for younger readers, I needed the third person to pull it off. 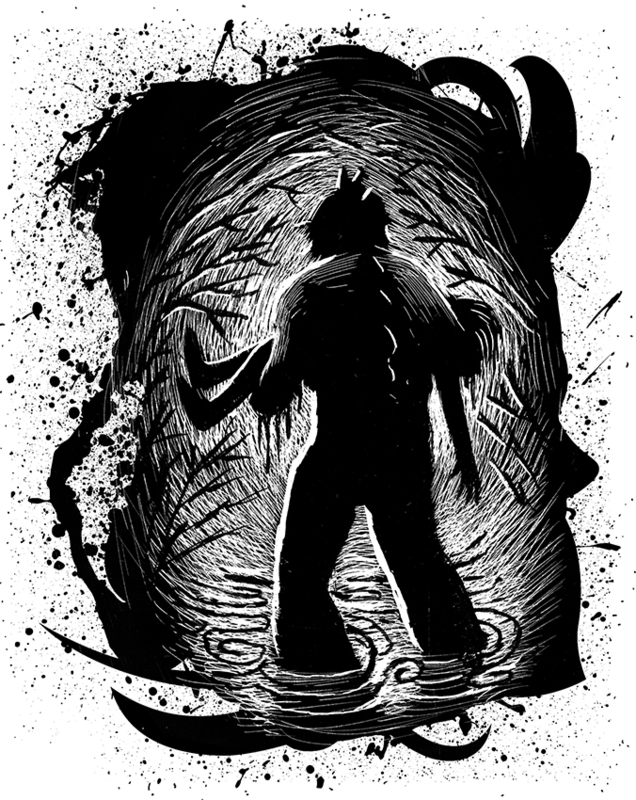 I wanted to write about my human characters, but later I wanted to go deep into the swamp and reveal more of the swamp monster. Part of the suspense in the story is that, for a time, only the reader realizes there’s a monster in the woods. To the three children in the book, well, they are just walking deeper into the woods. They don’t know what they are getting into — but the reader does. You see the difference there? 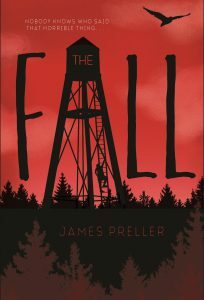 I didn’t write a sequel to Bystander, but I did write a companion book that explores many of the same themes and ideas, titled The Fall. It is written in the first person, with the concept being that it is entirely told from the perspective of a boy writing in his journal. Booklist reviewed it, “A rare glimpse into the mind of a bully . . . . Pair this with Jay Asher’s Thirteen Reasons Why. Keep reading like a writer. Books are truly the best education for anyone who wishes to write. Read widely, read deeply, read often. And yes, thank you for reading my book. Hi again! I honestly did not expect you to reply so quickly, let alone at all. And I would love to thank you for answering my question, even reading this email is an extraordinary honour. I love the way you worded this to explain why you decided to write your book this way, I mean, you are a well known author. 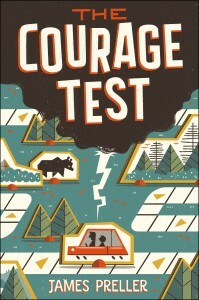 A quick plug for my new book, THE COURAGE TEST. It’s a literary road trip along the Lewis & Clark Trail and, yes, there’s a bear, both metaphoric and literal. Third person is an art which some people can’t wrap their stories around correctly to get such personality from the characters without blatantly spelling it out. You have that talent. Sticking close to Eric’s point of view, like you do, provides the third person flare while contributing glimpses of first person to the story. I am only human though and, personally, think, still, that first person may have been a better choice, but, as you said, there are reasons why you decided this for your story. It was a calling of sorts. For example, if you were to use a first person POV for this book (or any piece of writing really) you would have less ‘tag’ lines, as I call them, to describe who was talking. Especially the main character. Having less use of words ties you down as writer and limits, as you said, how you can write your story. 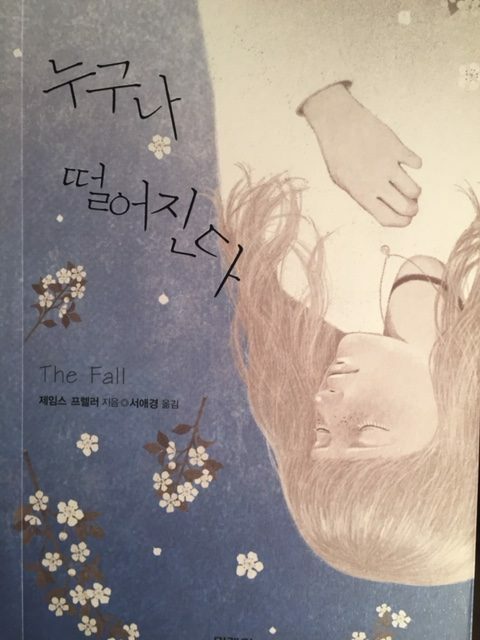 As for your other book, ‘ The Fall’, I would love to get my hands on it. The way you handle this topic is absolutely phenomenal. You wrote ‘Bystander’ so well that I will surely enjoy reading way more of your delightful books. Thank you, once again, sir and I’ll have to work on that invitation.